Fallow deer are know for their beautiful palmate antlers, making them a beautiful trophy. 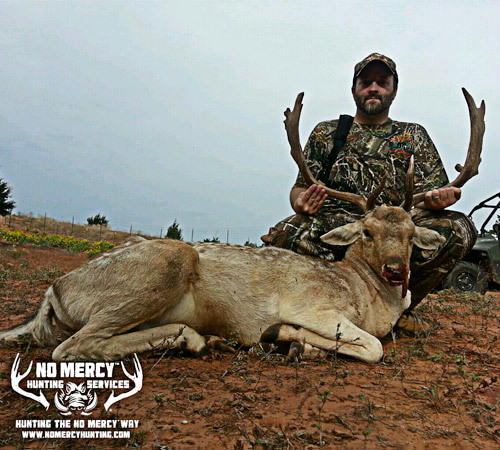 No Mercy offers some of the best Fallow Deer hunts in the nation. We offer fallow deer hunts during the antler season for this species which is normally September through March. Our hunts are conducted in some of the most challenging and beautiful terrain in Oklahoma. Bucks range in size from 130-200 lbs. The fallow deer is native to most of Europe and has been hunted in other parts of the world for centuries. They are also known for their mild venison flavor. Fallow deer have 3 basic colors: white, chocolate, and spotted. 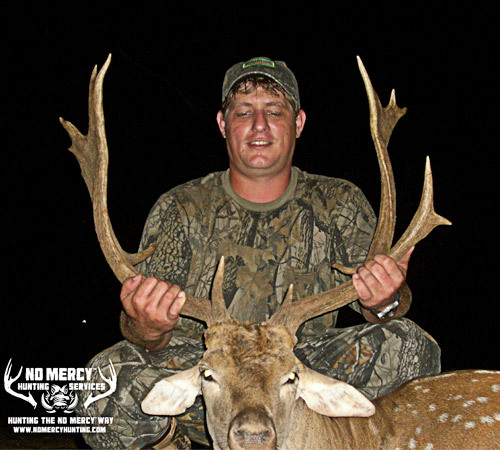 These Fallow Deer Hunts are fully guided hunts which include lodging at our rustic lodging which is some of the best in the industry we are continually told by hunters. The hunts offer our Guarantee and we also provide transportation on the ranch and game recovery for your kill. Our full service guiding service is second to none. We can combine a Fallow Deer Hunt with other species as well. Just shoot us an email or give us a call and we can arrange the hunt to fit your needs.